PLUS: Human rights leader Kerry Kennedy to join farmworkers, students at UNC Chapel Hill march and rally! 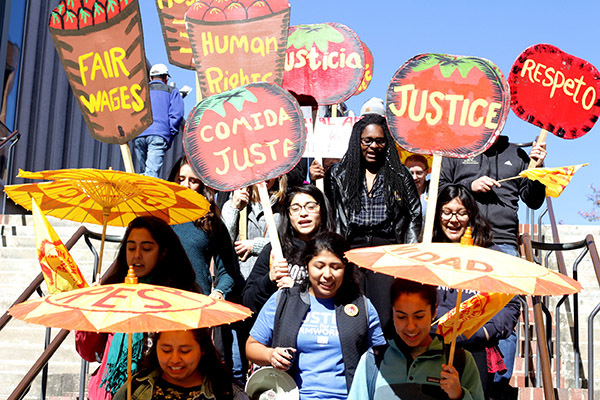 On the afternoon of March 5th, during the very first stop of the 4 for Fair Food Tour, farmworkers and their families will be marching through the gorgeous campus of the University of North Carolina Chapel Hill, alongside hundreds of students and community leaders. For the past three years, UNC Chapel Hill students have been organizing tirelessly to call on the country’s first public university to live up to its declared mission of “leading change to improve society” by ending its business relationship with Wendy’s and supporting the award-winning Fair Food Program. … The fact remains that housing Wendy’s on our campus rewards the fast-food chain for evading responsibility and prioritizing profits over human rights. Meanwhile, our own University’s reputation is put at risk by Wendy’s reckless decision to turn a blind eye to abuses in its supply chain. Wendy’s has already faced condemnation for purchasing from farms with forced labor and exploitation – and when the next article comes, which it most certainly will, UNC-CH will also be associated with these horrific conditions. The demand for university campuses to cut their contracts with Wendy’s in solidarity with farmworkers – the Boot the Braids Campaign – is an important part of the multi-dimensional national Wendy’s Boycott. Our goal is not to ensure that we alone can feel superficially content with ourselves by eating fairly-sourced tomatoes, like those from Aramark. Rather, it is imperative that UNC-CH take a leadership role in severing its business relationship with Wendy’s until the fast food company joins the Fair Food Program and takes enforceable measures in support of fundamental human rights, dignity, and justice. These kinds of student-led solidarity efforts have been successful before, as was the case with CIW’s seminal Taco Bell Boycott over a decade ago. And earlier this month, news broke that the University of Michigan has already removed Wendy’s from campus. We, the Student/Farmworker Alliance at UNC-CH, are asking you, Mr. Guskiewicz, to use your power to call for the removal of Wendy’s from campus until the corporation signs onto the Fair Food Program. We are also requesting that you make a public statement in response to this letter, communicating your position on the issue by the first of March. As a well-respected public institution, we have a responsibility to do everything in our power to create a more just society and change the way major corporations with whom we do business treat those at every level of their supply chains. It is time for UNC-CH to demonstrate that we are standing on the right side of history: Firmly in support of promoting human rights across the country and the world, and standing in solidarity with those who feed the nation: farmworkers. Following in the footsteps of my father and mother, I have marched alongside farmworkers in search of dignity and respect in America’s fields for decades. Almost exactly 16 years ago, I had the honor presenting the 2003 Robert F. Kennedy Human Rights Award to the Coalition of Immokalee Workers. In a gala ceremony on Capitol Hill — including a speech by the late Senator Edward Kennedy and a letter of congratulations from former President Jimmy Carter — Lucas Benitez, Julia Gabriel, and Romeo Ramirez of the CIW were recognized for their courageous work fighting modern-day slavery in the agricultural industry and for their leadership of the national Taco Bell boycott. Only a year later, Taco Bell became the first company to sign a Fair Food Agreement, displaying admirable leadership as the first fast food chain to take this step towards ensuring human rights protections in their supply chain. In the following decade and a half, all other fast food chains followed suit. Except for Wendy’s. Today, I write to express my grave concern that the University of North Carolina Chapel Hill is continuing to do business with Wendy’s. As you know, there is a thriving national boycott of Wendy’s due to the corporation’s unconscionable refusal to join the Presidential Medal-winning Fair Food Program (FPP). The FFP is a groundbreaking partnership among farmworkers, farmers, and 14 major food retailers, including McDonald’s, Burger King, and Walmart, and in 2014 was heralded as “the best workplace-monitoring program” in the U.S. on the front page of the New York Times. It has been proven to be the most effective human rights initiative to improve farmworkers’ wages and ensure humane working conditions in the fields. In fact, the FFP has brought these transformative changes to your own state of North Carolina. I urge you to take decisive action in support of the Fair Food Program and farmworkers’ human rights more broadly by ending UNC Chapel Hill’s business relationship with Wendy’s. Ready to pick up some art and join the action yourself? Here are the details! Before we continue our reflection on North Carolina, let’s take a brief detour to New Orleans. A photo of “Silent Sam”, the Confederate Monument on UNC campus, from 2007. We quote Mayor Landrieu’s speech about the ethical imperative for removing Confederate statues in a support of the march to remove Wendy’s from the UNC campus for two reasons. First, because the university community at Chapel Hill has itself been wrestling with the very same question – to permanently remove or not a Confederate statue (right) that has stood on campus for over 100 years – for quite some time, and that question has forced university leaders to take a long, hard look at what it means to be on the right side of history. And second, even as the ongoing statue controversy has roiled the UNC campus, student support for the Boot the Braids Campaign – which is ultimately a campaign to combat forced labor, sexual assault, exploitation and other human rights abuses in U.S. agriculture by supporting the Fair Food Program – has also steadily grown. Students are demanding that Wendy’s be removed from campus as well, until the fast-food giant joins the Fair Food Program to ensure that farmworkers’ rights are protected in its supply chain and UNC Chapel Hill is on the right side of history. This spring, students, farmworkers, and their consumer allies will be asking the administrations at four of this country’s most important universities this simple question: What side of history are you on? Does your institution stand with those who have fought sexual assault and modern-day slavery for over two decades, built an award-winning program proven to prevent those and other longstanding human rights violations in the fields, and provided real hope for an end to the shameful legacy of farm labor abuse behind our country’s food industry? Or does it side with a corporation that has profited from farmworker poverty and abuse for generations and today stands alone among fast-food industry leaders in refusing to join the Fair Food Program? These two issues facing the university administration today – while very different on some levels – present UNC leaders with a very similar decision: Is the University of North Carolina indeed a force “leading change to improve society and to help solve the world’s greatest problems,” as it claims in its mission statement, or it is a force standing on the side of lost causes, with those who would block progress and “rewrite history to hide the truth,” in the words of Mayor Landrieu. The decision to remove Silent Sam permanently from campus should be straightforward. No statue “honoring” the history of that cause has any place on the UNC campus in the 21st century. No celebration of the Confederacy, when properly understood and not perverted through the false lens of “heritage,” can be justified, period. Likewise, the Fair Food Program has, beyond a shadow of a doubt, proven its power to “overcome the effects and influences of adverse historical, social, political, and economic factors” for the tens of thousands of farmworkers under its protections today. The transformation of the agricultural industry brought about by the FFP has not only been heralded by farmworkers themselves, but has won praise from human rights observers across the U.S. and the globe, including the 2015 Presidential Medal for Extraordinary Efforts to Combat Slavery and, even more recently, from the UN Special Rapporteur on Human Rights, who declared that the Fair Food Program “must be an international benchmark” in the global fight against forced labor. The decision to embrace the FFP and reject Wendy’s until it stops championing the lost cause of discredited corporate social responsibility and follows the lead of its competitors to support the FFP and worker-driven social responsibility should likewise be unambiguous. To do so is the only way, given the choice before it today, for the university to be true to its mission. If the University of North Carolina is to “accomplish (its) highest aspirations”, if it is to be among the top public universities in the country, it cannot stop at fine words without action. The decisions before its leaders are clear. All they have to do take a stand on the right side of history.